Steve Beckow: Good Evening Linda, how is your Inspired Self class going? Linda Dillon: I think it is going amazingly; the expansion, the insight, the wisdom that’s being shared, concepts and ways of looking at things that we’ve never thought about before. I’m blown away. It is a full time job and a full time joy and it’s amazing. The group, which happens to be a circle of 44, the number of God, is phenomenal. A huge part of the webinar series is the downloads and the attunements that are happening. And to top it all off it’s happening in the middle of the Mother starting the tsunami of love again, which I’m sure everybody is feeling. The energy has been quite delightful, but very intense. LD: And it’s not going to stop until each and every one of us on the entire planet is love. SB: Yes. We ask how we’re going to ascend. LD: And when you become love you’ve ascended. It’s just that simple. SB: That’s right. Let me allow you to make your transition. I understand that Archangel Michael wants to talk to us about peace. And with that, let me turn to Archangel Michael and welcome him. We’re eager to hear from you sir. 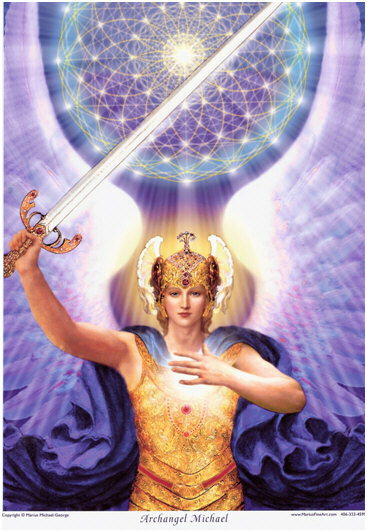 Archangel Michael: And welcome to you. I am Michael. 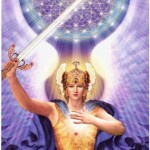 I am Me-kai-el, artist and archangel, Archangel of peace, warrior of love, bringer of news. And I welcome each and every one of you this night, this day, this time of magnificent change and a level of intensity and an anchoring of peace, not peacefulness but peace so deep within the core of each and every one of you. Just to start, then let us say, in the anchoring of peace is the removal and the elimination of turmoil, of core issues, of what you think of as vasanas of lack, of less than. What is the meaning of peace? Yes, there are various explanations of the human race, as adopted, but in fact most of it relates to the cessation or the absence of war. Now I am certainly not saying that that is not significant, it is, but it is not the level of peace – or it is not the fullness of the mission of peace that I am entrusted with – with all of you, and with many galaxies far beyond in the name and on behalf of the Mother and Father. How does war battle within and without even exist? What has happened to your hearts and minds, your emotional fields, that anything other than peace can even be an option? Yes, you say it has been ignited, but I will fight and I will do battle because I witness and I see injustice and abuse of authority and control. And you are correct. But is this not just the result of the absence of that inner peace that I am speaking of? Now you, beloved Steve, have talked about and mentioned several times about the confusion about this word love, and how everything is love. Well, peace is love. But I wish to drill deeper in terms of what peace is. Because within peace there is a large element, internal I’m talking about now, there is a large element: of knowing, of yes acceptance, a modicum of surrender, a modicum of trust, a sliver of hope, but truly knowing that there is an alignment and that there is a stand-alone truth that you are the daughter, the son, the hybrid of the Mother-Father-One. When there is not only the acceptance of the knowing of the truth of that the acceptance, and the anchoring of that, then what happens is there is an up-dwelling, a surge, not quite a tsunami – peace is peaceful. But there is a surge of simply knowing that everything is as it should be. And even when there is apparent chaos in the outer, there is a knowing by holding that peace that the outer reality, the outer world will fall into alignment. Because the outer expression of things and behaviors and actions that are not of peace are simply but a reflection and an expression of the absence of that inner peace; the absence of that alignment with the truth and the might and the power, the divine authority, and the acceptance of that authority of who you are. So it is not simply hope. Hope is a beautiful, supreme divine quality, but it also entails an element of trust, yes. Hope is not wishful thinking. It is the absolute trust in the unfoldment of the Mother’s plan. And in many ways it is the holding of that vision. But that is another conversation. I wish to truly focus on peace, and yes, these are all interrelated and so it is very difficult at times to separate them, especially when they are all blue. Let us return to peace. You say that you have had experiences, and when I say “you” I mean yes, you beloved Steve, but I also mean all of you, or most of you, because some of you have never had a moment of peace; in body, in form, in existence of this incarnation that you are currently occupying. But most of you have had that knowing of peace. When you feel there is a rightness to who you are, to circumstance, to environment, to relationships regardless of where they are at – now this is important, because this is what I am speaking of – but I am also energetically anchoring in each and every one of you this night. It is time for humans to remember to claim, to anchor and to be peace. Now this would not be occurring, if in fact, individually and collectively, you had not reached a place where you are willing, where you are given permission, where you have made the decision to anchor that wondrous peace within. So often, because peace has been defined externally, it is associated with tremendous effort. We are going to bring peace about! That is not possible if in fact the peace is not resting within you, within your beloved sweet soul, and within enough of you. Yes, we are talking about the collective, and you know that when we are talking in this way – and this day we are addressing the issue of peace – that you understand that we are talking about the collective moving forward once again in those final steps in what you think of as ascension, so that this can be completed and you can get on with the business of truly creating and co-creating nova earth. Now of course that is partially already underway. But this wisdom factor of peace is one of the essential ingredients. Where do you wish to begin? SB: Well, you talked about ‘truly knowing’ and I just wonder if we don’t need to clarify something here in the same way we needed to clarify love, that when you say truly knowing you’re not talking about intellectual knowledge, not even talking about having a feeling or an intuition or a sense of something, you’re talking about something much deeper than that, right? AM: That is exactly what I am talking about. It is about the truly knowing, true, true knowing, wisdom. It has, well, I would say nothing, but I will adjust that and say very little to do with emotionality or intellect or mental body. It is heart and soul knowing, what you call realization, what we might even hint at, in terms of enlightenment, or illumination. The true knowing will filter through to your feelings and to your intellect and to your beautiful mental body, and reassure the ego and delightful personality that you are, but it is heart and soul knowing. There are things, sweet angels of light, that you truly know about yourself even when you sometimes – occasionally, I’d like to say deny about yourself – you truly know that you are alive even when sometimes you think, “Oh this is just a dream,” you truly know that you breathe. And that is not simply a mental or emotional or even a physical quotient, yes, your understanding about the body is truly expanding, genuinely deeply expanding – that there are not these artificial separations. Truly knowing comes from the deepest and the highest part of yourself. It is where the union of your universal self, your higher self, your what you may think of as your human self in your soul center comes together to inform you, if you wish to think of it as that, of truth. And one of these truths is peace. Peace is that feeling of a sigh, if you want a physical explanation. That there is no need to rush about. That everything truly is in order. It does not negate the need or the desire for action, particularly concerted or directed action, in fact it allows it and enables it to take place, but not in a helter-skelter kind of fashion. When you truly know something about the universe, about us, or about your sweet self, then it is beyond question. It has the depth and the density of fossils and bones, of rock, of boulders, the ancient existence of mountains. Is this clear? AM: Yes. I use those examples very specifically. I did not say that peace feels like water or air. I am likening it to the elements that you will recognize. So it is like stone. It is like bone, fossilized bone. It is the Rocky Mountains. SB: That’s why Jesus said you could build on rock or you could build on sand. AM: That is correct. I am preferential to rock. SB: So am I. When I went into this experience of peace it was like an experience of returning to something. It would be as if I walk into a warm house wearing an overcoat, a sweater, a shirt and I took off the overcoat, I took off the sweater, I took off the shirt. I found myself, and you were talking about how it’s not a place where you are passive, you don’t act. I found that it was the natural self that was acting. I had unfailed, I’d taken the obstacles out of the path of the natural self, which is naturally peaceful. AM: That is correct. And in that, the mental, emotional, egoic subterfuge of having to wear many layers – because you yourself are not substantial enough – disappears. So in coming to this place of peace and of knowingness, of the substantial nature of who you really are, what you are doing, and this is why I want to talk about it…is the anchoring, like your granite…of what the Mother has made, what the Father has made. You see so many humans, especially, and I will use the past tense, believed that they needed to be lighter than air, that they did not attach to the earth, that they wanted to go to the higher realms. Peace is the knowing that you experience it all in form. This is a fundamental quality of ascension. SB: Well, it’s a fundamental quality of ascension as it’s becoming the new mass in physical ascension. Is that not correct, Lord? I’m not sure that it was the quality of ascension, say 2000 years ago, was it? AM: You have not had this experience of ascension in this manner 2000 years ago. Yes, you are correct in that. It is part of, but no even let us go back, let us go back to some of the sages, or the saints, or the brilliant prophets etc. Think about, feel, how they behaved. They came from a place it was often called faith. Peace is more substantial than mere faith, trust, hope. We are not dismissing them but we want you to understand the sense of knowing in form even then that you could go forward and do the Mother/Father’s bidding, which is exactly the same as your bidding, and do it regardless of what was happening externally – that you would have felt the external but the external wasn’t going to determine you. And so in that, those ascended ones that simply took on a different realm of existence, did have an anchor piece. Because before their departure they still anchored that knowingness and it was that knowingness that allowed the platform, as it were, the liftoff. Now, what you are doing is you are anchoring peace, and we know this is a difficult conversation but you will also note we are having more expansive difficult conversations of late. So let me say what you are doing is you are anchoring the peace, the knowingness, the truth of who you are in that substantial, natural self in physicality, not so you can leave, but that you can stay. Those who are not anchoring the divine qualities, who are literally saying “no thanks I’m not interested” can’t stay. They will not have enough substantiality, materiality, wisdom to hold the vibration to be able to physically exist on Nova Earth. So this is a very important part of what you are doing. And what we are doing with you and even as I am speaking, I anchor this blossom of peace, this granite of love within you. AM: Do you feel it? SB: I certainly feel peaceful. That’s for sure. AM: Then I am doing my job. SB: (laughing) Wow! God knows how many thousands of people you’re affecting right now. AM: This is my joy. When all is done, when peace within you exhibits on the outside, which is not just no war but truly harmonious relationships and ways of being and behavior, then I will invite you to come and listen to our music. More importantly you will hear our music and you will see me painting the sky. SB: That means something, Lord, the little bit more than just the words might seem to indicate, does it not? If I were to hear your music that would transport me to another realm, would it not? SB: Thanks. I just like listeners to be aware of that. Lord, a word about hope. AM: What word would you like my friend (laughing). SB: This is the spiritual supermarket. I can order anything that I want. (Laughing) Yesterday, in the reading that we had, you talked about not living in the past and in the future. I have two conflicting teachings here. One is that hope is trust in the Mother’s Plan, that it operates the law of attraction – it brings something to us. And the second is that it is not living in the moment, it is postponing things to some distant future, “I hope it will happen.” And, I’m not doing stuff to have it happen. So, can you help me reconcile those two teachings? AAM: Oh, I would be happy to! Now this is part of the other course that we have been running, which is the redefinition of words. So let us talk about hope – hope and trust. Hope is the trust in the Mother’s Plan, in the unfoldment of the Mother’s Plan. And there are many, many upon your planet, who I claim as my Legion of Blue as well, who are holders of hope. Their job is to hold hope for the Mother. Now why am I starting there? Because it is important, even in that very beginning, to realize that there are human beings whose mission and purpose in current reality is to be those anchors – think, not the wings but anchors, and beacons at times – cell towers at times – of hope. In physical reality, hope is holding of the belief, the trust in the unfoldment of the Mother’s Plan. Hope that you are in the right place at the right time, in the right mood, in the right frame of existence does not negate action, quite the contrary. I am so glad you have asked me about this! What does hope translate as? When I talk about the holders of hope – and all of you, all of humanity is to a greater or lesser extent holders of hope. But there are some who that is their primary purpose. It doesn’t mean that you sit and twiddle your thumbs. It doesn’t mean that, “Well, I hope that that happens tomorrow.” It means that that trust that is in unfoldment gives you the impetus, the catalyst, to act according to that today. There is no point in simply holding out hope for tomorrow when you are living in your now. Yes, time is fluid; the Mother’s Infinite Time is completely fluid. But even as I speak to you we are in your current existence of now. So, what you are doing…you are not playing the hope game as the delay game. You are saying; “I hold hope, I hold trust, I hold the vision.” Actively holding it. And, because of that, because of that alignment, I take actions in certain ways right now. It is not a permission slip to negate or ignore your current life, quite the contrary. So there is an action piece in hope that has mostly been ignored. Do you understand what I say? SB: Yes, what you are describing comes very close to intention too. We set our intention and it is to achieve whatever the object of our hope is. AAM: That is correct. And that is where you are doing it. It is in the creation formula in alignment with Universal Law. When you set your intention – whether it is a chant or a prayer or thought or a deeply held belief – what you are doing is setting your intention. Even when you are screaming at God, you are setting your intention. And what is that based on? The hope, the intention is actually heard and responded to. So it is in the expression of intention and hope that the beginning of the co-creation – the conjoining of the sacred partnership begins. SB: Well, if that’s the case Lord, then talk to us more, please, about how we do this. In our morning meditation do we set our intention? How do we work this Divine process? AAM: Morning, noon and night and in between. Now let us talk about this. Let us break it down into, shall we say, big intention and smaller intention, personal intention and global intention. Now there is also a – I was going to say habit but I am saying addiction, because it has really reached that point – and this is a flashing yellow caution light for lightworkers and loveholders. So please heed what I have to say. Global intentions, collective intentions are beautiful and sacred and holy and when you come together in global intention miracles happen. We have seen this. And you will certainly see more of it. But do not ever think, feel or believe, my family and friends, that somehow global intentions are more important, more valid, more worthy than the personal whispers of your heart. That is why I have started today by talking about the peace within you and the anchoring of that ‘truly knowing’ within you. So, when you are setting intentions, we do recommend every morning. There needs to be time. And if you think you do not have the time, you are deceiving yourself, you are fooling yourself and you are robbing yourself. You take the time, whether it is an hour or ten minutes or five minutes, to set your intention, not only for the planet and the galaxy and the universe, your family, but also for your sweet self – for your day, for what you are working on. So, from that sense of peace comes the expression of hope, of what you intend. Not only to draw in; attraction and repulsion is but one Universal Law. But you express – not only to all of us, not only to your circle of guardians, but to your sacred self. You are expressing what you intend to experience. You see there is the joining of forces when you are expressing that intention. And then we would love to see you, of course, express world peace. But it starts with the personal. You cannot be praying and intending and hoping for world peace and have your home front a battleground; or have your internal self out of harmony, out of balance, having an internal battleground. It will never work. So, it starts with you. And then, yes, by all means, move to the grander intentions. And do it in conjunction with your community – whatever your community is. Whether it is a temple or a community center or a coffee klatch. Intend it and do it. And, know that we are joining with you to do this. That is what intention is. It is setting out. It is sending the spiritual, telepathic, electronic, light wave communication to say, “This is what I want. This is how I choose to express and experience love.” And, it is very proactive. It is not simply sitting in a chair or on the sofa watching TV saying, “I intend to win the lottery.” No, you have need to take action that is in alignment with your intention. And the more action you take – and sometimes, sweet angels, the action is sitting on the couch perfectly still. So, you have to pay attention to the guidance. But it is in accordance with what you want. And then we would love to see you take action and to again express intention at a mid point in your day, so often, it is part of the human experience, we understand that. So sometimes you would set your little watches or your phones that have such remarkable capabilities these days, and you would say, you know, at twelve o’clock or one o’clock or two o’clock or whatever the middle of your day is, take a few moments, not only to visit with us, not only to visit with your intentions – to check in. How is it going? But to check in with your sacred self, because sometimes there is need for a little reset or an expansion. So your business meeting is completed and you are feeling pretty good. And you think, “Well, I’ve done it.” When you go to the middle of the day and reset, it gives you a chance to expand what just happened, so that the rest of your day is not simply in time out or not being fully present and aware, but expanding that energy of that intention – of being seen, of having harmonious conversations, of being a team player. And then at the end of the day, and particularly – we will take ‘thank you’ whenever we get it – but particularly at the end of the day. AAM: That is correct. Well, we have all been working hard to help. We are extraordinarily busy. And so of course, what we want is for you to be busy as well. SB: Aren’t you simply describing the ways that the natural self, what you call the sacred self, acts or operates – hope, intention? We talk about peace or we talk about intention and it sometimes can be a little disembodied. We’re really talking about the unveiled self. Can you talk a little more about that from an overview perspective? AAM: Yes. And it does not matter whether you call it your sacred self or your natural self or the truth of who you are. It is as if you have read, studied, ingested, digested the entire owner’s manual and you know exactly how and why you operate. And you are fueling yourself correctly. You are not revving the engine or idling the engine. You are simply moving forward. And when you do that, when you add your intention – we are talking in action now. So, you’ve gotten up out of your chair and you’ve gotten up off the couch and the radio or TV is off, or your computer. And it is important, dear ones, to turn off your electronic computers etc. from time to time to really be in the silence and the still point and the spaciousness – to really feel the energy waves, particularly the Mother’s Tsunami – so that you can differentiate what is the collective, what is yours, what is ours, without any other interference. So, yes, there are many opinions on this and it is constantly discussed. We see your conversations so we are throwing that in gratuitously. But back to the natural self, you take action – can I make it this simple: that is pleasing, that is joyful, that is pleasurable, that is fulfilling to you. And in that, it is because of that alignment, it is pleasurable, and enjoyable and loving and kind to everyone. That is how peace outside, without, occurs. It is you expressing that peace, that true knowing. So you don’t do things for yourself that you know are harmful. You don’t attach or reattach to old patterns or paradigms of behavior that you know are going to hurt. It is not that the knowing and the wisdom isn’t there, it is. And it is already ignited in you. It may not have been 10 years ago, but it most certainly is now. So when you do something, when you feel that you are in step, when you reattach even for a moment and you know – that’s not me, I’m not behaving like who I truly am – then correct. That is why we suggest that reset during the middle of the day. And when you misstep, do not just apologize to the person that you may or may not have offended, or to us or to Source. Apologize to your sacred self and then with clear determination, not just determination, clear – the clarity of the Mother, continue on. You see, often you think that we expect you…that there is expectation on our side, on the part of the Mother. And expectation is a dangerous thing and it does relate to hope. But there is not an expectation that you are already saints, let alone martyrs, in body. Now do you have that full capacity? Yes. And do you behave saintly? Yes. For what is that delineation anyway? It is absurd. It means a kind and loving, gentle, determined, clear person in alignment with the Mother. We are right back to peace and there is no expectation on any of you ever to be martyrs. That time has come and gone. Do not engage it! “Oh, I will do this, I will sacrifice myself because something else is needed.” No. There is plenty of whatever it is you are thinking of to go around. We live both tangibly and etherically and esoterically and intangibly in an infinite universe. There is no so such thing as shortage. And that is where you natural self, with a little help from your friends, will take you. SB: Lord, you say a little help from your friends. There is this equation between our steps that we take and the Divine response. Is there not? AAM: It is exponential. You know, there is this thing that we are always talking about, this quality called free will. So we do not interfere. And think of this as Divine Source 1. So we allow you, and you allow you and we assist you for every little step you take. And so yes, say you take a step forward – now for you it is going to feel substantial – and we want it, we desire it. Not expectation, desire. We want you to take that step, to know the Divine Authority of taking that step. But say you take a step and it is a foot long. The Divine comes millions of miles toward you. It is that big. Now, the only proviso I put on this is now you shudder and you think, “Oh no! That means the Divine is billions and billions of miles away from us.” Yes, I can read your minds. I say it for purposes of emphasis. The Divine is right there in front of you. It is as close as the air touching the skin on your face and the Divine is already fully and clearly imbedded within me. So what are you doing when you really take that step in hope and trust from that solidity of peace? You then become the Divine meeting the Divine. You are meeting yourself and you are meeting the without. So, yes, the Divine will meet you wherever you are – right there. And then what happens? It will take a step backwards to give you the room and the spaciousness to take the next step, and then the next step, and the next step. Have you ever watched a parent trying to encourage their child, their baby, to walk? And they stand right in front of them with their arms extended ready to catch them. And then they back up and then they back up. And, they are so excited! The baby is walking! That is exactly what we are doing. AAM: We love precocious children. SB: Well, all lightworkers must be precocious children. AAM: They must be. Now what we do not like are destructive adults. So then, you would think, “Well where are we? Where is the Divine?” Exactly in the same place, maybe even a little closer. Because those destructive adults, they need the help. And that is where your global work comes into play of holding peace, of holding the vision of a world that works for everyone. Of holding a vision where there is not a separation between human beings – that some are good and some are bad, that some are in and some are out. Hold that vision. That is the global work at the moment. Hold the vision of what you are desiring, what you are intending, what you are bringing forth in tandem with us. SB: You mentioned to me yesterday in our reading that there is a significant group of people who have invested in the currency revaluation who are coming from a right – wrong perspective. So it is not even going to be that as we begin our work building Nova Earth that all of our colleagues will, for instance, be in a unitive perspective? AAM: That is correct. But also understand, with you anchoring the peace, with you holding the intention – individually and collectively – and interacting and holding that space, the conversion factor will be enormous. SB: OK. Well, I have to say that we are nearing the end of the show, Lord. And again, and so often I just wish that we could go on forever. AAM: We do go on forever, my friend. SB: Is there anything that you want to say in closing? AAM: This day, this night, this afternoon, I have given you – I have activated peace within you. Receive it, sweet ones. I do this on behalf of our beloved Sacred Divine Mother. And, I do this on behalf of each of you. Treasure this and allow this granite to blossom. Go with peace and go with my Love. Farewell.